Always make sure your car is serviced when recommended by the manufacturer. Not doing so can cost you a lot more in the long run, as it can lead to excessive wear, breakdowns and expensive repairs. Needless to say, if parts fail in the braking or other safety systems, it can also be highly dangerous. Many people think that the easiest place to go is the nearest manufacturer's dealership, however, this does not guarantee that you'll get the best value or service. As an Independent car and van servicing & repair centre we are able to offer good quality servicing at a much reduced labour rate. We are also able to select your service and repair items from the worlds best known brand names such as Bosch, NGK, Fram, Valvoline, Mann & Hummell, Fram, Hoppecke, Delphi Lockheed, Quinton Hazel, LuK, Walker and Arvin. This ensures that your vehicle is serviced and repaired with OE specification parts and lubricants. 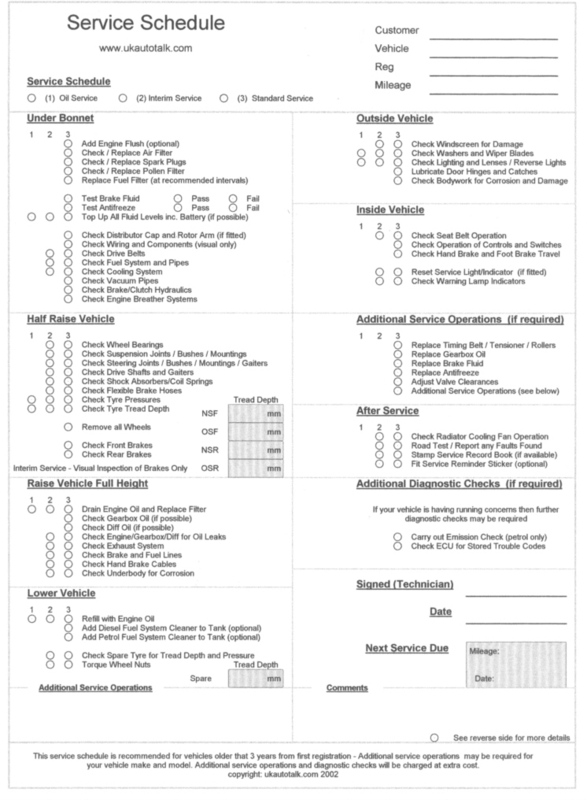 For vehicles 3 years or older we recommend using the UK Auto Talk service schedule. Click on the schedule to see it full size.